In the customer loyalty survey process, one of the keys is to make sure that your survey addresses all of the product and service attributes that are important to your customers. Seems simple and logical, doesn’t it? But as they always say, it’s not always as easy as it seems. Determining what is important to a customer is the subject of a recent post in this blog. And to determine what should go into that list of “potentially important” things is the subject of this blog item. These potentially important areas are the source material for the questions in your survey and are very important. Getting a full and representative set of potentially important areas is critical in developing your survey. Remember that if you don’t include all of the areas that are important to your customer in your “big list”, as I call it, then your survey will provide the wrong feedback. You will simply have the wrong information on what is important to your customers and any action you take on the basis of this information may be flawed. There are three key sources of potentially important things. While this is easy, and fast, it is not necessarily the best place to find attributes that are important to your customers. Like everyone else, your staff have their own set of views and filters, especially if they work in product development. They will often tend to think that what they think is important, i.e. the product feature they have been involved with, is important to customers as well. It is common that internal company perceptions of which service attributes are important do not match with customer perceptions of what is important. When questions are generated exclusively from in-house material and staff input this can easily lead to a customer survey that asks irrelevant questions and does not capture what really drives customer loyalty. By all means ask your staff what they think customers care about, but make sure that you also source some ideas from elsewhere. Desk research means looking at all of the available information in your business and trying to extract potentially important ideas from it. Think about all of the existing customer feedback processes, complaint data, market research, product development input, etc, that you have in the organisation, and get it out. Review the information to see if you can identify any themes that might be important to customers and add them to your list. Also, look at on-line and at the academic research to see if you can find useful references that can also be used. Access to this information is now easier than ever so make sure that you use it. Lastly, ask you customers. Obvious isn’t it really, but few organisations take this last critical step. The most effective approach is to perform qualitative interviews of a representative sample of your customers. You can do this either face to face or over the telephone. Interviews will generally last between 30 and 60 minutes and, if done properly, will generate a range of feedback for the “potentially important” attribute process. How you perform the interviews is also important. You need to be as open with your questions as possible and not lead customers responses. We often use the Convergent Interview technique when performing these interviews. It allows a relatively open starting point and reduces the chances that you will miss a key potentially important area. When performing these interviews we find that the face to face approach works very well. After about 15 interviews per customer segment, the number of new themes coming from the interview process falls dramatically. At that point we can bring together the data into series of themes, key points or potentially important areas for use in the survey process. So now after looking at these three sources you should have a good, broad list set of potentially important attributes. This then is the source material for generating the customer survey questions. 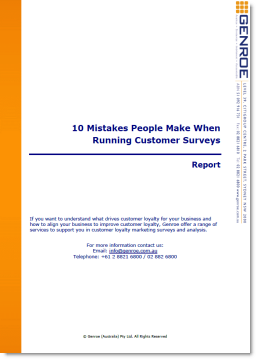 If you take this approach to the development of your survey questions the chances of missing an important driver of customer loyalty is substantially reduced and the success of your survey process improved.